← Happy 2nd Birthday, Brooklyn! Posted on August 20, 2012 by Becki M.
Let me get this out real quick. 1. I can’t believe that London is old enough for school! What?! 2. 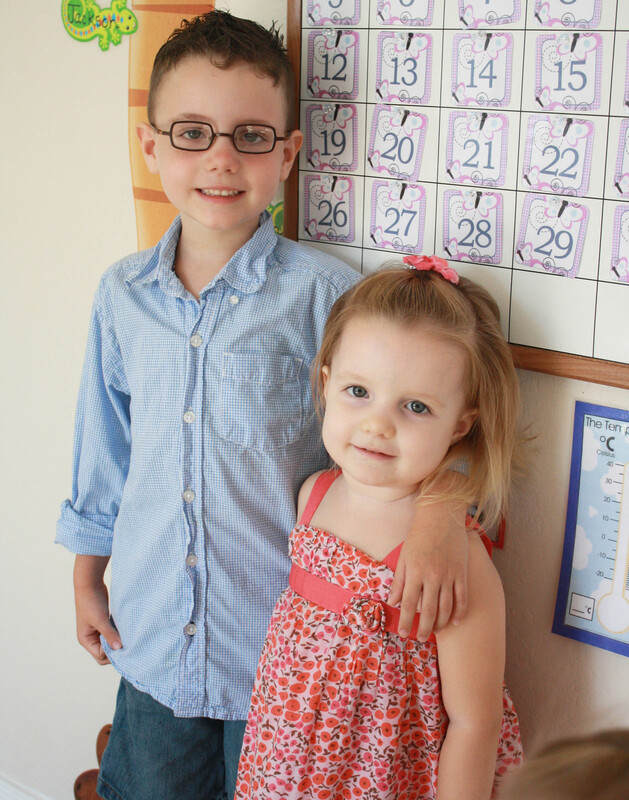 I can’t believe that I now have two kids to teach at the same time (deep breaths). 3. I guess it could have gone a lot worse. 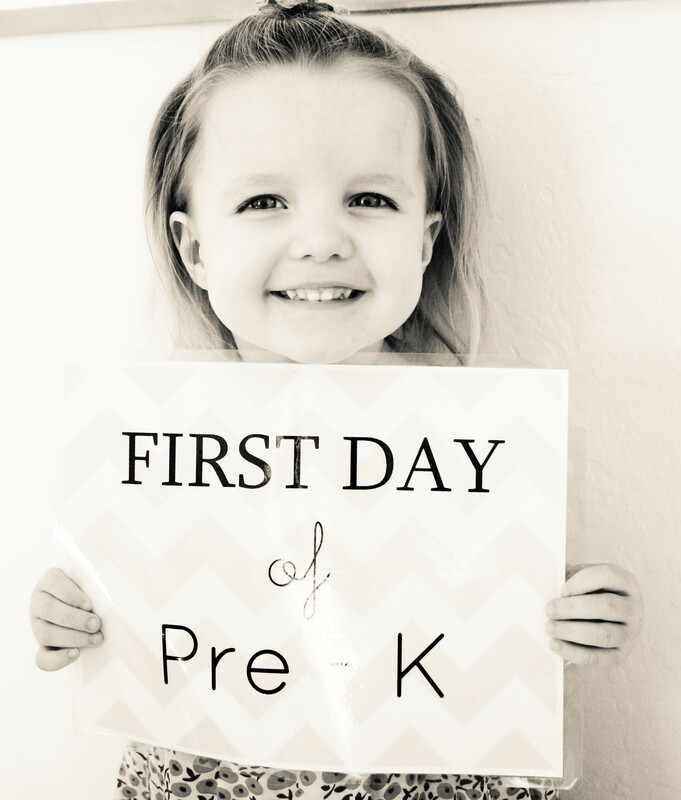 For a long time, I was sad that we missed out on traditional “first day of school” mornings. Then I decided that I didn’t want those memories, anyway. I could make better ones that didn’t include me waking up before dawn and rushing around the house in a mad dash to get everyone out the door on time. Ones that didn’t include me bawling my eyes out in parking lots while I left my child behind (even though I know they’d be fine…but still). So, no longer do I miss those would-be memories. 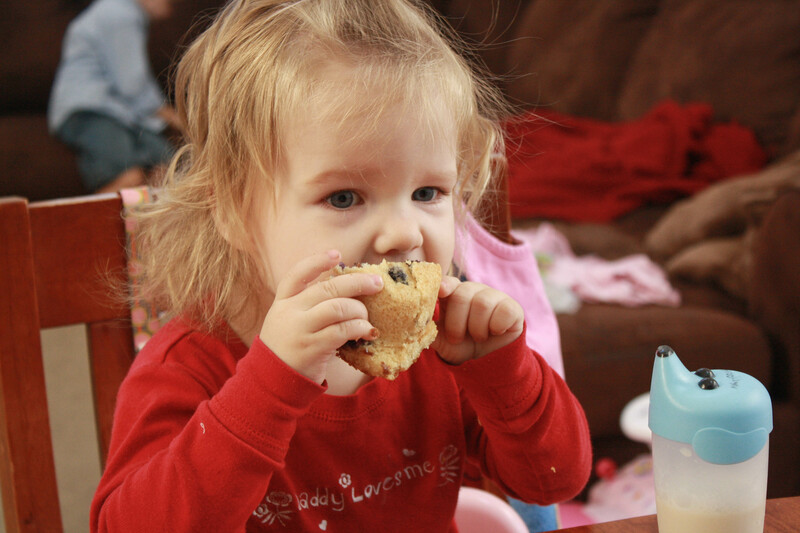 Now, our first day of school mornings include homemade blueberry muffins. 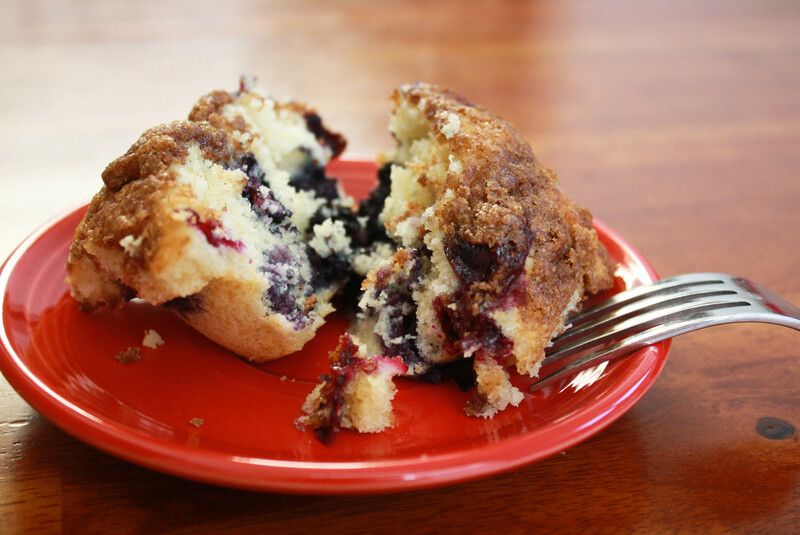 Muffins that we wouldn’t have time to make together if we were rushing to leave the house by 7:30. Or 7. Or whatever break of dawn time school starts, lol! They were delicious. I leisurely drank my coffee, praying my worries away for the day, and took the time to enjoy blueberry covered chins. You could say I was dawdling, perhaps a tiny piece of me trying to avoid the inevitable chaos I was sure to find around the corner. Here is the get real time: I am ALWAYS nervous. It may seem like I have it all together and homeschooling is a breeze and gosh, I must be so patient…nope. Not in the least. What I do is hard, and requires a dying to self almost minutely as soon as the school bell rings. *gulps coffee*. The first day went as well as could be expected, I suppose. We start off with calendar/ circle time. We sing a Days of the Week song, a month of the year song, a color rhyme, the weather, today/tomorrow/yesterday, and Days in School. Jackson also does a section on time and money, which he really likes. After calendar, I get Jackson started on Read to Self, and then get London started on her first activity. She did awesome! 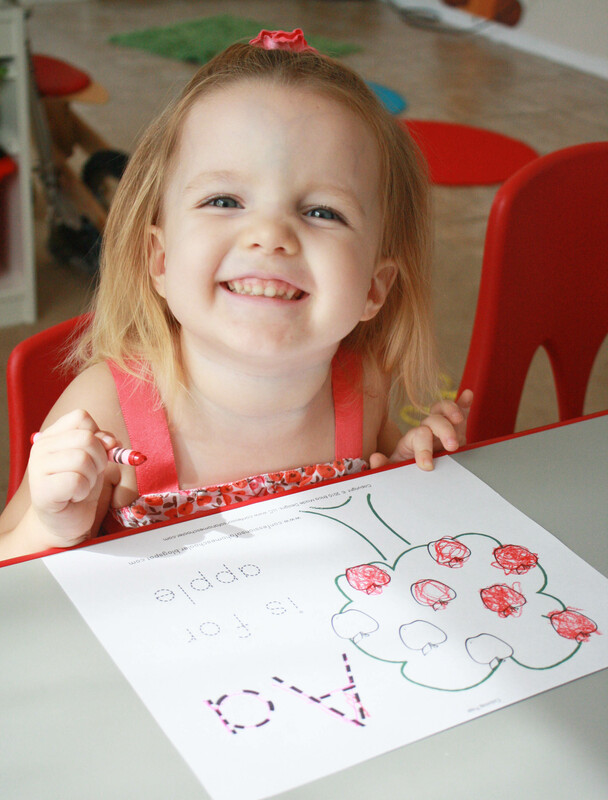 She colored in her tree and traced her letters. She laced an apple card. This will take some practice for her; in fact, the whole program will. 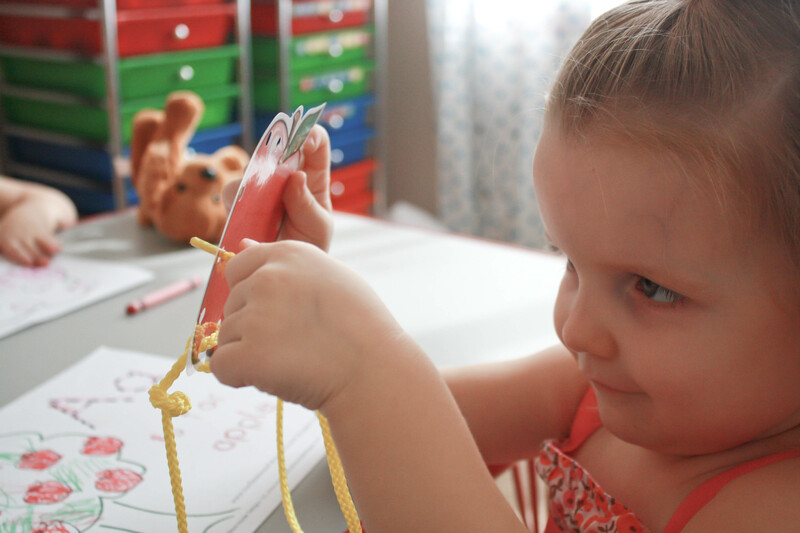 I am going to slowly build up her stamina for learning; right now she worked on her coloring page and laced the apple and that was it for her. She had decided that she was D-O-N-E. That’s fine. 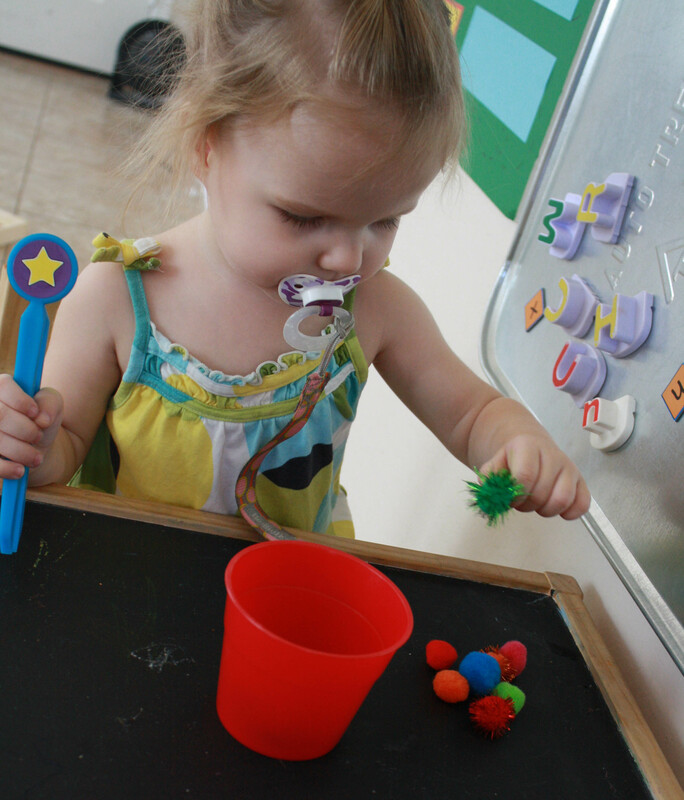 Throughout the rest of the morning I gave her random things to do like color puzzles and pom pom sorting. Brooklyn got in on the pom poms, too. They have little pinchers they use to pick up the balls and put them in the cup. London loved this and sat there for at least 10 minutes. Progress, right? After Jackson was through reading, we did a lesson from First Language Lessons, and then I sent him on to Word Work. Today, he did “Write and Stamp”. 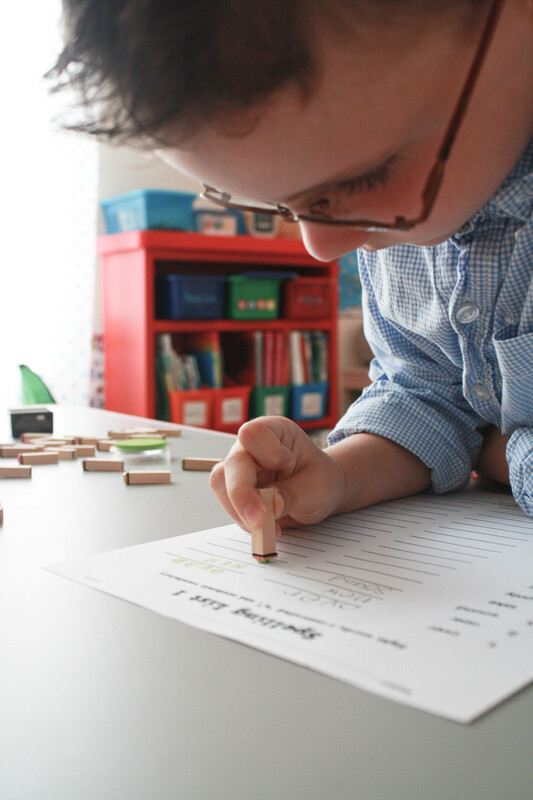 He took his spelling list and wrote the word, then stamped it out. This was a winner; he loved doing this! I took time to work with the girls while he was doing this. Then we did a lesson out of Writing with Ease, and afterwards he grabbed his Work on Writing box which had some worksheets on “First, Next, Last” for him to complete. 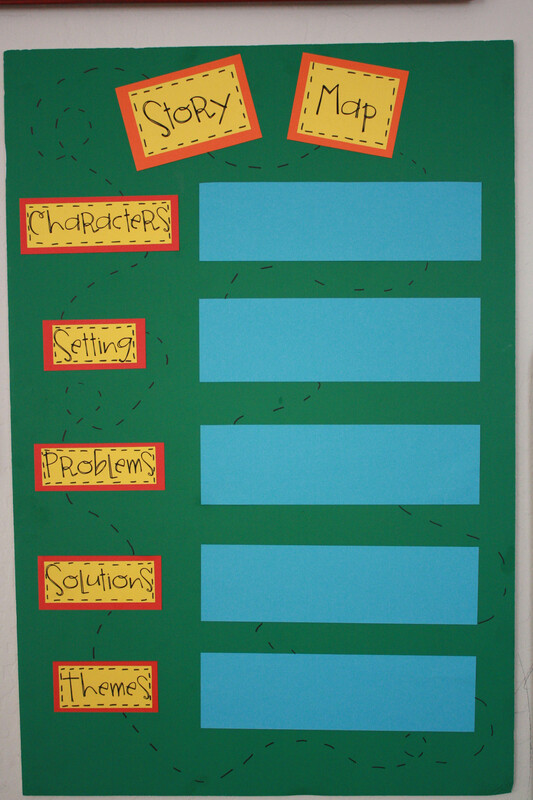 This year we are really focusing on elements of a story and different genres, so we are jumping in head first! I LOVE this idea I found on Pinterest, and can’t wait to use it starting tomorrow! As we go through stories, we will use Post It notes to jot down the various elements of the story. I think this is really going to help Jackson grasp the concepts of good writing and comprehension. After a lunch break, we worked on Geography, which will be M/W/F (Science is T/Th). We are using Expedition Earth, and this week is studying the globe. 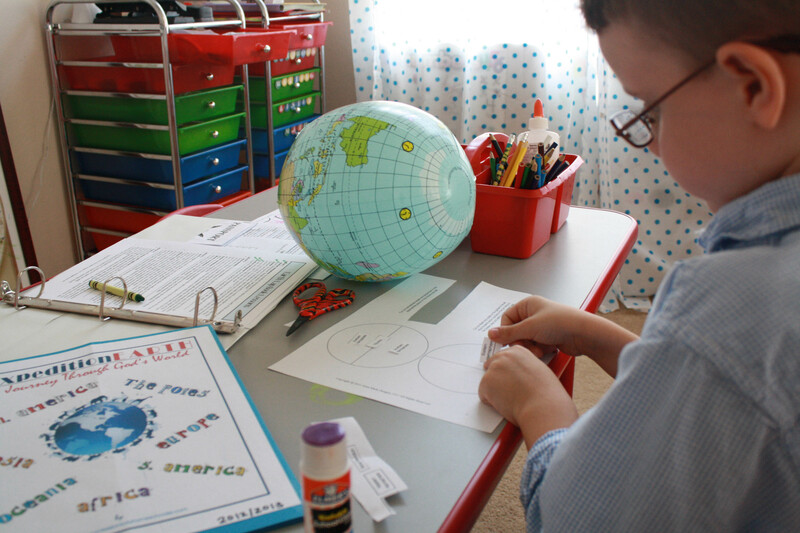 Jackson is learning about the Prime Meridian, hemispheres, etc. this week. Math is this afternoon. I always save it for when the girls are resting so Jackson can concentrate. 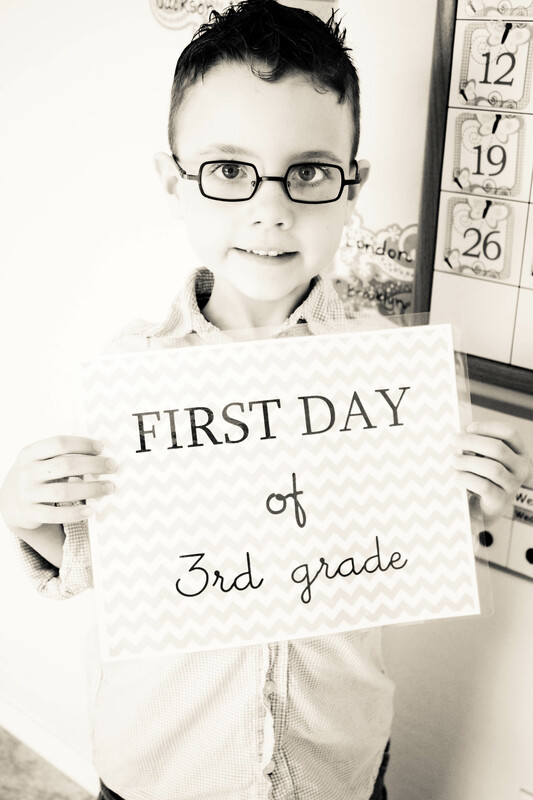 He starts multiplication this year, which he is really excited about! 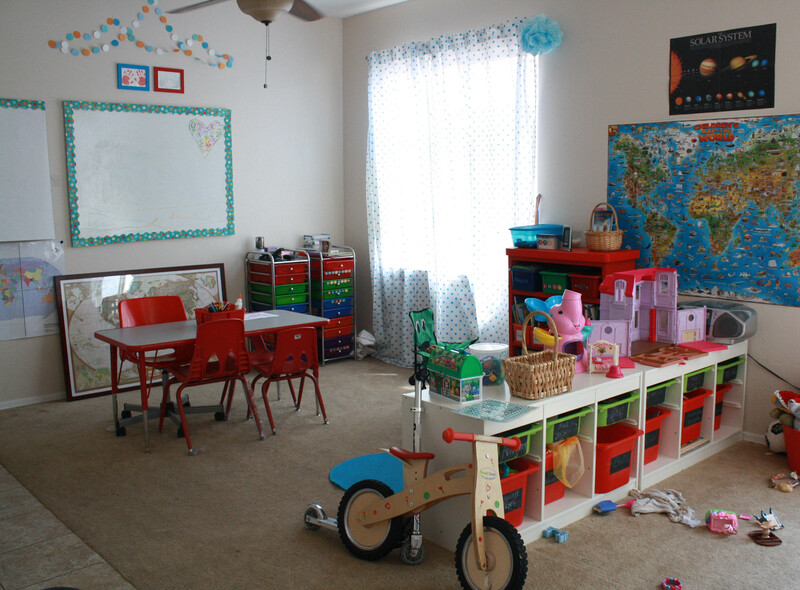 Here is a peek at our schoolroom/playroom. It is divided down the center of the room, which I really like. Whoever isn’t in school can play on one side while the other can work. I left it messy. 🙂 You can see our workbox system over in the corner; I am really going to like that! It will take a week or so to get Jackson in the routine of just getting the box he needs at the right time, but it will come together. If Jackson is working on something where he needs to spread out a bit, the girls sit over here and play. This little table has really come in handy! 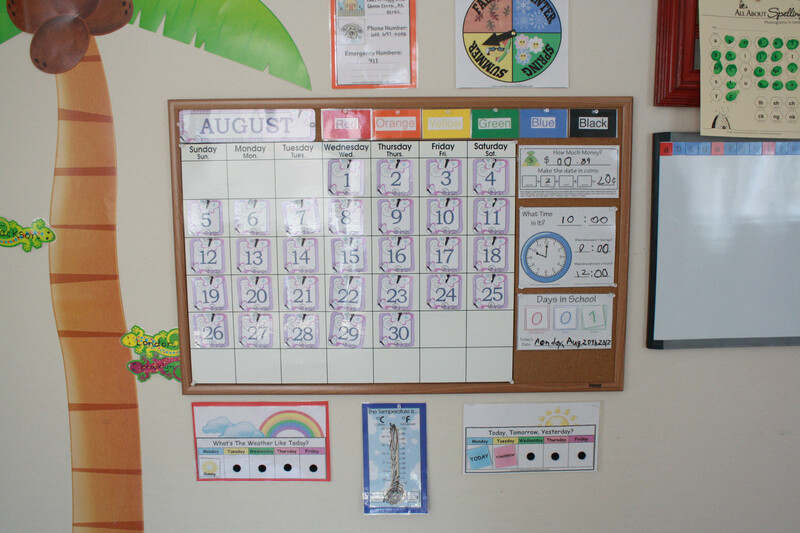 Here is a larger image of our circle time corner. 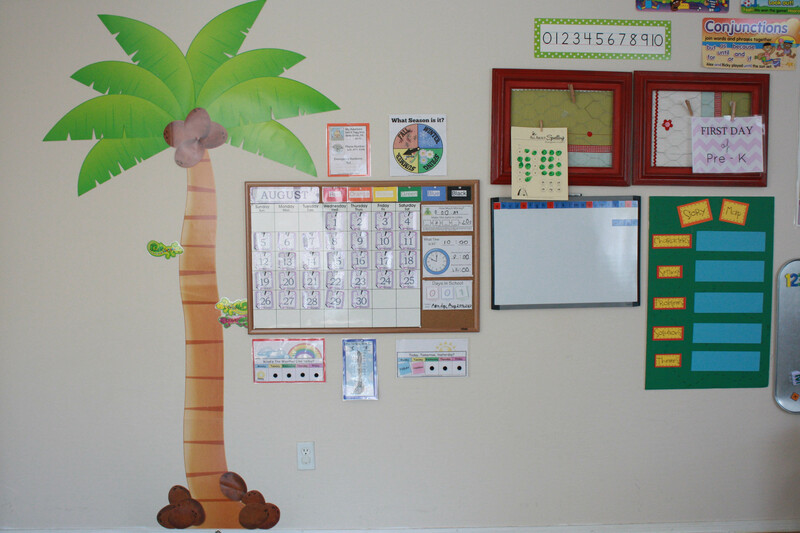 The palm tree is for Chicka Chicka Boom Boom; every week we put up the letter we have been working on and read the story. You can see our All About Spelling board to the right of the calendar, our Story Map board, and then the girls workstation to the right of that. On the floor they have little carpets to sit on. Work in progress still, but its coming together! It went pretty well, I think. I only thought to myself twice about throwing in the towel and giving up, lol! I just have to remind myself that these first few weeks are the hardest, but it will all come together as the kids settle into our new routine. Posted in Homeschooling. Bookmark the permalink. I think what you’re doing is amazing! I agree, you get more done when organized. 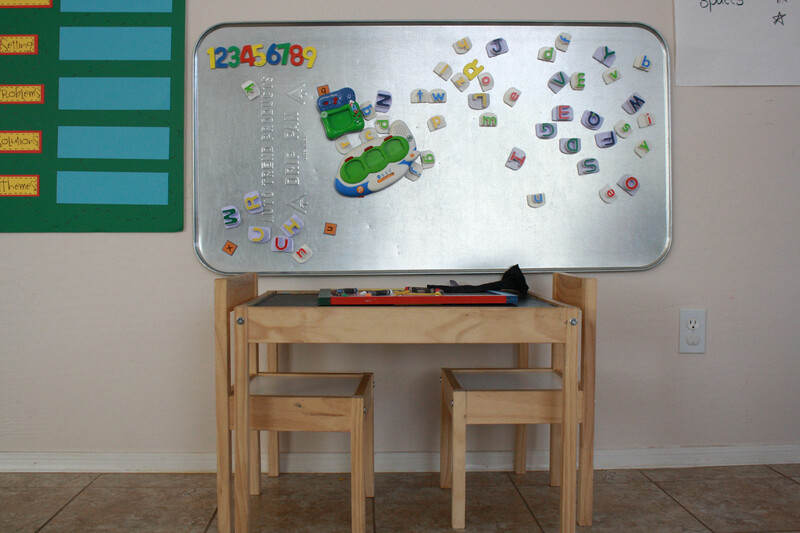 Just keep remembering……YOU have 3 kids and a household to run and school to teach! Sometimes you’ll need a nap too! Give yourself permission to take one! Love to you all!